Learn the basics of ocean diving and take a dip into the ocean. You’ll fish watch learn about protecting the ocean and help clean and protect it! You’ll dive in a completely environmentally-friendly way, learn about maritime ecosystems as you take in the rich diversity of fish and plants, underwater caves and old boat wrecks from below the surface. Get to know the basics of ocean diving and learn how to dive in an environmentally-friendly way. Gain a better understanding of the sensitivity of marine ecosystems with a focus on marine pollution and solutions. Help clean up the ocean by collecting trash from the bottom of the sea. • Good for: Children from 10, adults, solo travelers, families, students. Groups and professionals. • It includes: All necessary diving equipment and a professional diving instructor. 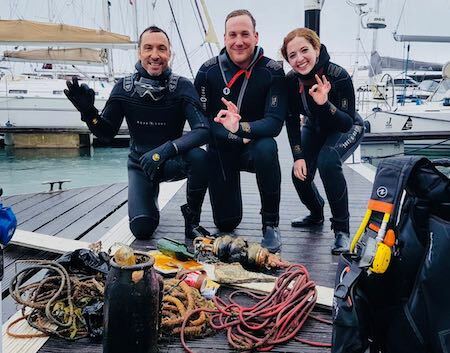 Eco-diving in Cascais is the perfect experience for everyone who loves the ocean from top to below the surface! You’ll learn about fish watching, there’s an amazing colour spectrum. You’ll get to ouch weird seaweeds, explore mystique underwater caves and old boat wrecks! You will discover wonders hidden below the surface of the ocean including a well kept Portuguese secret involving a sea treasure. During this fascinating trip you will have the chance to explore the Atlantic Ocean from below, and also contribute to cleaning it! You will get introduced to the important basics of ocean diving as and the essential safety procedures for discovering the wonders of the seabed. You’ll also learn everything you need to know about the sensitivity of marine ecosystems with a special focus on the marine pollution problem. If you already have prior experience with diving, you can even help to pick up trash from the ocean floor. Dive in!